Samsung Galaxy S4 vs Samsung Galaxy S5: should you upgrade? Enough to make the jump? 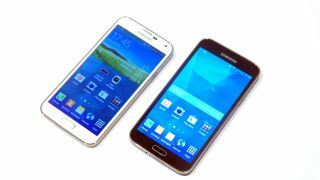 The Samsung Galaxy S4 is no longer the king of Samsung's smartphone range, having been usurped by the recently revealed Galaxy S5. It goes without saying that the S5 is an improvement over last year's device, with perhaps the only exception being the screen (more on that in the video). But is there enough going on to warrant an upgrade from the S4? Well, for all you Galaxy S4 owners now looking forlornly at your phone and wondering just that (what are you, made of money!? ), we've put together a quick, no-nonsense comparison guide that will assist you in your decision. Why not read our hands on Samsung Galaxy S5 review?